Great post. Lloyd really is one of comedy's kings. I ran the Dartmouth College's film society in 1976-77. The Lloyd estate released his films for screenings that year -- I think through Time/Life -- and we picked up the entire package. We ran his movies every Friday night in a big auditorium for the entire semester. 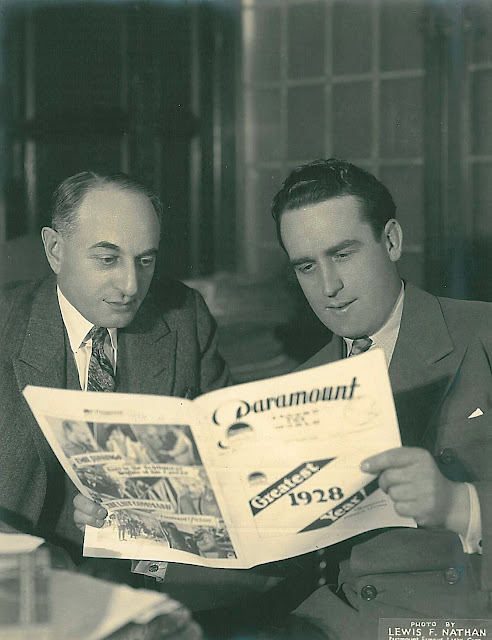 The Lloyd comedies were a hit on campus whenever we provided live musical accompaniment. Usually, just a piano player, but it worked. When the piano player was unavailable, we ran the sound track that accompanied the prints. Whenever we did that, the movies bombed. The canned sound tracks were awful. Cutesy and telegraphed and cliched and painful. So, my point: real magic happens when a great silent comedy is accompanied by great live music. There's really nothing like it. New York's Film Forum ran a Lloyd festival about 10 years ago -- I caught "Speedy" and "The Cat's Paw." 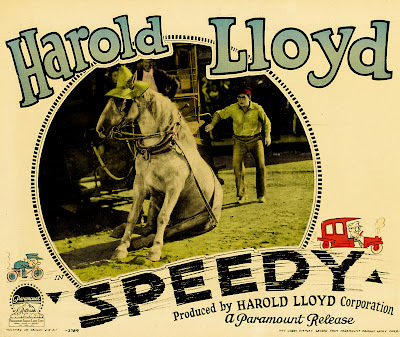 The audience loved, loved, LOVED "Speedy" -- partly because it was shot on location in NYC, but mostly because of Lloyd himself. It was the first time I'd seen any of his movies. Terrific stuff. And the pianist accompanying it was first rate, even including the "Speedy" theme used during the original release. Following the movie, the theatre manager held up large cards featuring the lyrics so we could all sing along. One of the best movie nights in NYC ever for me! That's great info about your Lloyd college runs, Tom. I guess the Time/Life prints would indeed have been more palatable with the sound turned down and a live accompanist in their place. If only everyone had done that! Live music really is the finishing touch for a successful silent era revival. East Side, I can only imagine the warm reception a New York audience would give "Speedy" with all that location work done mere blocks away. Thanks for giving us insight into what such showings were like. Speedy is great but you should check out the Kid Brother. That's my favorite Lloyd. His films are great but Harry Langdon is funnier to me...and even less known nowadays! Volume Four of the Stooges collection includes a 1945 short titled "Booby Dupes". It starts out as a remake of "Towed in a Hole" with the Stooges as fishmongers who decide to catch their own. But while Stan and Ollie are alone in a single setting for almost the whole film, the Stooges use more locations (or cheap sets, anyway) and actors for some odd digressions. There was another I can't find just now, where the Stooges are working undercover and Moe does a short version of Harold Lloyd's tuxedo bit from the Freshman (Larry takes the tailor's part, trying to make repairs from behind a curtain). I recall reading that Lloyd sued his former writer Clyde Bruckman for this sort of recycling but don't recall if Bruckman's name was on that particular film. I grew up in the 1970s and was a classic comedy kid. 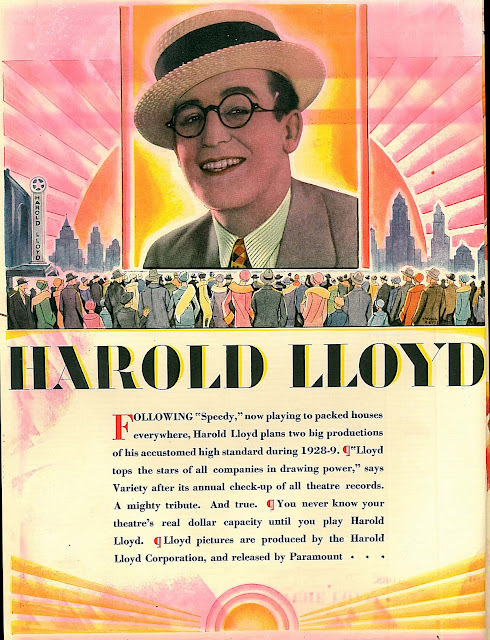 I was fortunate to have a local PBS station run the Lloyd features as well as a narrated “clip” show called “The World of Harold Lloyd” (or something like that). It was only years later that I learned of the editing butchery contained in these offerings. And while as an adult I probably wouldn’t appreciate the soundtracks, they didn’t bother me as a kid. I guess my point is, even in compromised form, I was blessed to be introduced to the marvelous Lloyd. I was a big Chaplin kid, but in Lloyd I found someone who made me laugh more often than Chaplin… and almost as much as my favorites, Laurel & Hardy. I’ve always preferred Lloyd to Keaton as well. With Keaton, I watch and often awe at his inventiveness – he’s an absolute genius at intricate set-ups with big payoffs – but I find myself admiring the craft more than laughing at him. Probably because I have a hard time warming up to him due to the stoic nature of the character. I guess for me the characters that most appeal to me are the put-upon everyman’s. Even Chaplin isn’t always so easily relatable – how many of us have been destitute like his Tramp character often is? But in Laurel & Hardy you have two guys just trying to get by, make it through a world they’re expected to navigate even though they don’t entirely understand it. THAT I get. And Lloyd… well, most of his characters were everyman personified. Just an honest Joe trying to do the best he can, be it in his job or his love-life, and most often, both. In a way that’s optimistic and often cheerful. And that’s why I think he endures and surprises people to this day – his “can do” characters still resonate with people. As for Lloyd the filmmaker, he was fantastic at constructing both gags and plot devices. In fact, the way he weaved gags and plots together could be quite sophisticated and must have surprised audiences when first viewed. Many of the old comedies, as much as I love them, are patchworks of scattershot gags that don’t connect, but Lloyd seems to have taken to heart Chekhov’s admonition not to introduce something in Act 1 unless you plan to use it by Act 3. Additionally, he wasn’t afraid to take risks, as not just his “daredevil” films showed (the risks being the very real possibility of serious injury or death) but also some films with offbeat stories (like the unusual and fascinating talkie “The Cat’s Paw”). My personal favorite falls into this category – “Why Worry.” Lloyd is the last person you’d probably expect to do a film with political subtext, but true to form, even such weighty topics as war and revolution in “Why Worry” and corporal punishment in “The Cat’s Paw” are filtered through his optimistic everyman persona. 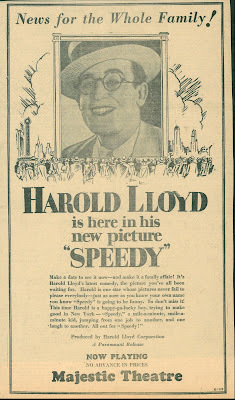 "Speedy" is my favorite Lloyd film, complete with the great Babe Ruth cameo appearance. "It would convince anyone there was a future in silent movies to hear the three kids screaming and giggling and flopping about. Think of every cliche about comedy-- convulsing with laughter, howling with laughter-- and they were doing it, reminding you how long it's been since you saw a comedy that truly had that effect. My 10-year-old offered the highest praise of all-- "This is as good as the one where they tear down the house." That is, Big Business, which is universally accepted in our house as The Greatest Movie Ever Made, and trotted out for every sleepover guest we have." 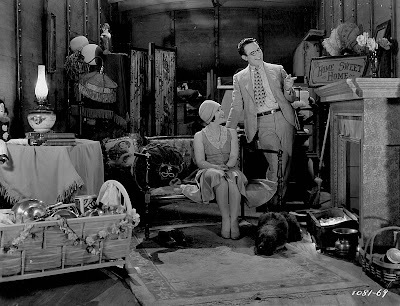 Nobody was better than Harold Lloyd at story construction and pacing; starting with brief comic scenes that establish the characters, following them with longer sequences which advance the storyline, then building to a crescendo and breathless finale. His characterization - "you may be brawnier, but I'm smarter, more resourceful and more charming than you" - is simple, but works extremely well in the comedy + swashbuckling action + touch o' romance formula, and, unlike many comedians, Harold sticks to his concept from start to finish. That said, it's no surprise that Harold Lloyd's best features still rock the house in 2009. 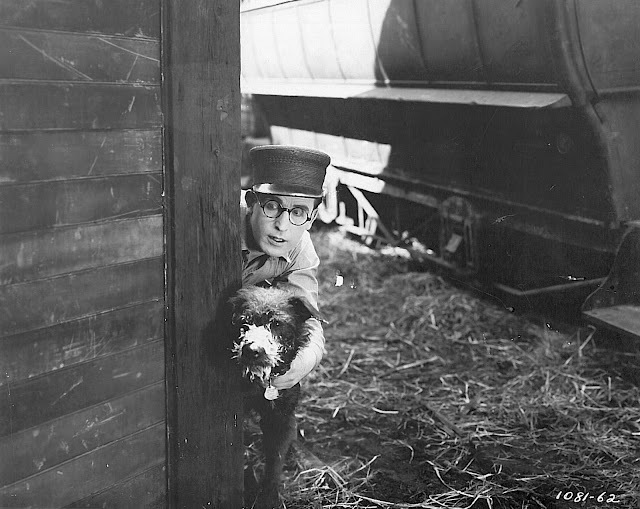 I can attest to how Harold Lloyd could work an audience. In the summer of 1971, I took a friend to see a film society screening of Lloyd's skyscraper comedy Never Weaken. As Harold teetered blindfolded high among the girders of a building under construction, laughs alternated with gasps and yelps of alarm. Finally my date turned to me and urgently whispered, "Jim, I can't take this anymore!" And would you believe it, within twenty seconds Lloyd was back down on solid earth, safe and sound. 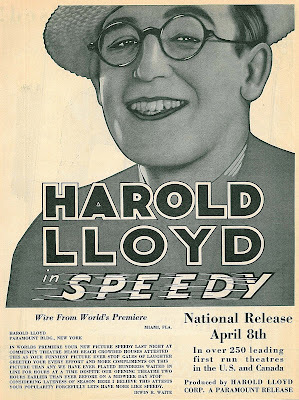 Even fifty years out, for audiences yet unborn, Harold Lloyd knew exactly how far he could push it, to the split-second. Couple little, minor tid-bits to add to this: I was one of the "lucky ones" who saw Mr. Lloyd appear on the college circuit. (It must have been very close to his passing), one afternoon at UCLA. He came with a print of "Grandma's Boy", which I believe he named his "personal favorite", then answered questions afterward. He seemed like an extremely nice man, modest and very soft-spoken. During my last year in high school, we had moved to a house way-up on Benedict Canyon, which belonged to Bob Hope's publicist. I'd be driving down the hill to high school in the morning, and would occasionally see a car, usually a simple station wagon, pulling-out from the Lloyd driveway, and in the backseat would be Mr. Lloyd. As regards those late-planned 40's re-issues, John, here's an interesting piece of trivia I ran-across, which would probably never cross your path otherwise, but I think is worth sharing. In researching the lives of William Eythe and Lon McCallister for the project I'm currently at work on, Lon, who was under independent-contract to Sol Lesser, and "loaned-out" to Fox for all those movies with June Haver, was announced around the late-40's by his producer, to star in a remake of Lloyd's "Girl Shy". McCallister, who projected exactly the right balance of innocence and resourcefulness that had been Lloyd's hallmark in the twenties, would have I think been enormously effective in such a film. It, of course like so many things, never happened. Thanks for the great commentary on Lloyd. Regarding his standing in the 50s and 60s, I got a hint while looking at some Youngson compilations recently that he developed a grudge against Lloyd, perhaps for withholding material. In The Golden Age of Comedy the narrator identifies Harry Langdon as one of the "four" great geniuses of silent comedy. But by the time of When Comedy Was King, which has clips from Keaton and Chaplin as well as Langdon, there are only "three" great geniuses. I'd love to see a print or two of the Time/Life series despite prosperity's somewhat jaded view of them - 30-odd years ago I'm pretty sure they were my first exposure to Silent comedy (albeit over-dubbed with wisecracks), leaving an indelible influence on both my infantile and grown up tastes! 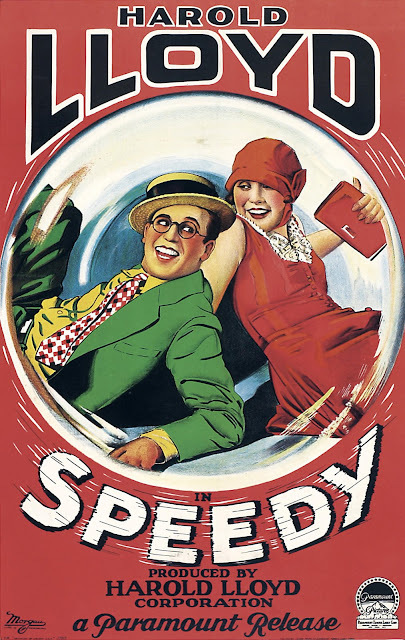 I can still vividly remember watching them as a child on dinner-time BBC 2 back in the early 80s, thanks mostly to the "Hooray For Harold Lloyd" theme-song forever firmly lodged in my head. I also vividly remember that "Hooray For Harold Lloyd" song. Am I right in recalling some or all of the shorts in that version having an arch and annoying narrator as part of the soundtrack? They did have soundtracks, Devlin, and the narration was usually awful. Time/Life Lloyds were/are probably best watched with sound turned down or with alternate music accompaniment. I even like "The Sin of Harold Diddlebock" and "The Milky Way" tended to show up fairly regularly on TV a few years ago. I wonder why he never really succeeded in talkies. A very American persona, still Keaton's pathos gives him the edge for me.